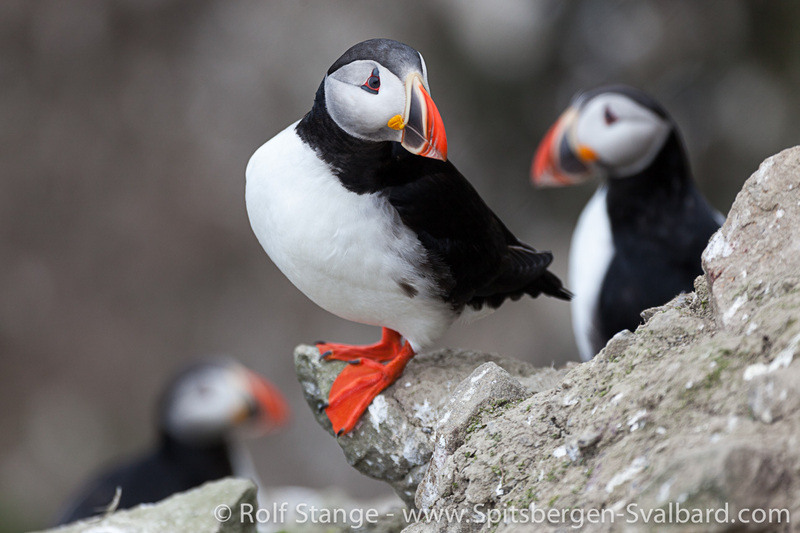 A number of months ago, coming across stunning photographs of Puffins, permission was sought from the photographer and world traveler, Rolf Stange, to use one of them for the painting of a miniature. Getting such spectacular images of these illusive birds takes persistence and resolve. They spend nearly all of their lives in open sea, coming to shore only to breed. Here is more about them….. Here is Rolf’s wonderful photo which was the inspiration for a watercolour miniature …..
….well now, Cynthia, now you’ve got me wondering–DO they hoot? 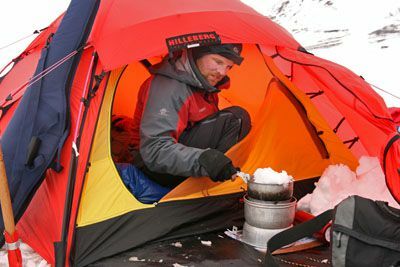 It makes me ask myself, ‘what sound do penguins make’? I haven’t a clue–but it almost seems fitting that Puffins are silent–that they are just so polite and cute, they make no noise whatsoever. Even the name of them is endearing. I’m surprised there weren’t stuffed animals done up, ala Paddington or Winnie-the-Pooh. These seem like a perfect subject for halloween….not so much because they are orange and black—though that is a hoot…do they hoot?—-but because there is a strong theatricalness about them, a masquerade, as you mention, as if they’re just taking a break, and waiting for their cue to go onstage at the Commedia d’el Arte….Thanks for a treat of a posting, Lance! …..oh my, thank you Deb! It was fun doing this painting, though I admit it felt somewhat strange because this is a bird I have absolutely no direct or life experience of, so know nothing about. Trying to paint them is difficult for that reason. I have no idea if the end result is actually like them, or is really just reproducing a photograph. ….Charlie, it would be a thrill to see them, I’m sure. From their description it appears it wouldn’t be remotely possible to keep Puffins happy in a zoo setting–thus, their appeal is all the more enhanced by their obscurity and mystery. …. Sharon, we are such bird-lovers, aren’t we though! Thank you for enjoying the painting….the orange feet slay me. And those clown-like eyes, like something out of the Venice masquerade. ….yes, Sibella, I also find them intriguing and touching as well–partly because they have such an expressive face, but also because they seek out the same mate each year, take turns incubating the single egg….it is so sweet, no? ….I so agree with you Teresa, thank you. What makes them the more endearing to me is learning they are only 10″ tall. Their beaks and proportions had me convinced they were much larger–penguin-sized. ….thank you also, Andrew, and it is a testament to these lovely creatures how they capture our imagination and make us want to paint and depict them — I hope your wife’s painting of them gets posted! 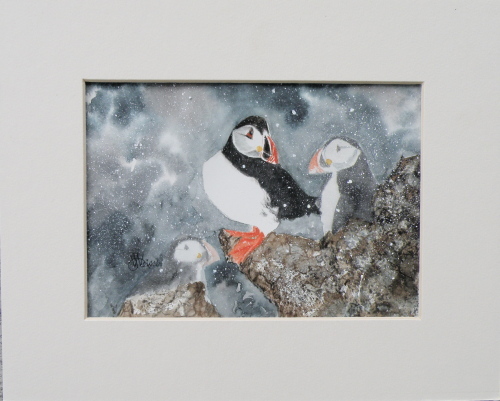 Thank you Lance sharing your Puffin miniature painting. You have captured the exquisite beauty of the puffin. I love their orange feet. Also, the narrative and links are very interesting. So lovely! Puffins are such interesting little creatures, true works of art. That’s a great photo. Love the miniature. Interesting to me this week since my wife returned from her oil painting group and showed me the sketch of puffin painting she’s about to do. Thank you for this very cool story, tribute and everyone’s artwork.